The reference to cracked concrete ties in the Dearborn subway are to ties that were installed as a result of ARRA within the past 3 years, so they better not be too damaged. The Jefferson Park canopy to which you referred seems to be over the expressway between the train station and bus terminal, if it is the one indicated in the illustration. You saw that too. Well if they are damaged there sure is an absence of slow zones. Lately the big slow zones are in the kimball subway. I'd be more concerned with that. They have a bad leak at logan square on the platform right through an electrical box. If we get this deep freeze next week they might have a skating rink on the platform!! If your referring to the division sign that's new. (You can see the shiny brackets holding the sign, anything down there with all that water will age rapidly or weather. ) The CTA announcement was from the 16th of dec. btw. My hunch is that all the blue line subway stops will get those and this is just a pilot. I think the congress stops are coming next as part of the congress rehab. So eventually they will all have one. 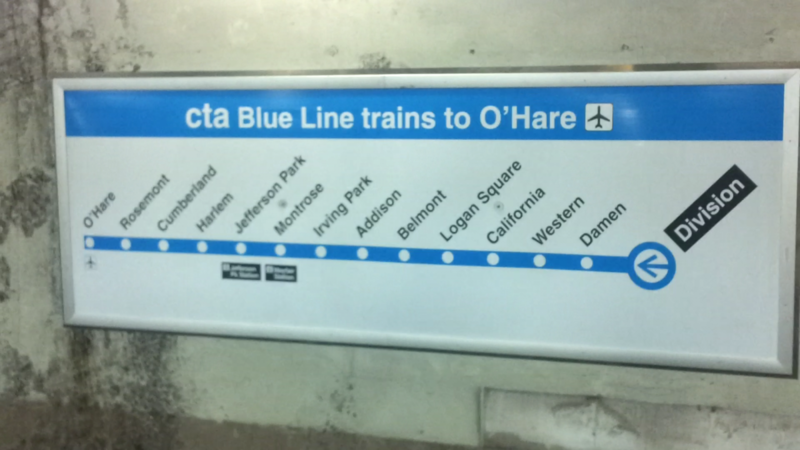 Most of the subway stops that got rehabbed or renewed got those signs, that's why Division/Blue looks so weird. The water is already removing the repainted tunnel walls there. Some other Blue line stops have them like Logan Square or Jackson and I believe Clark/Lake. Belmont didn't get any though. 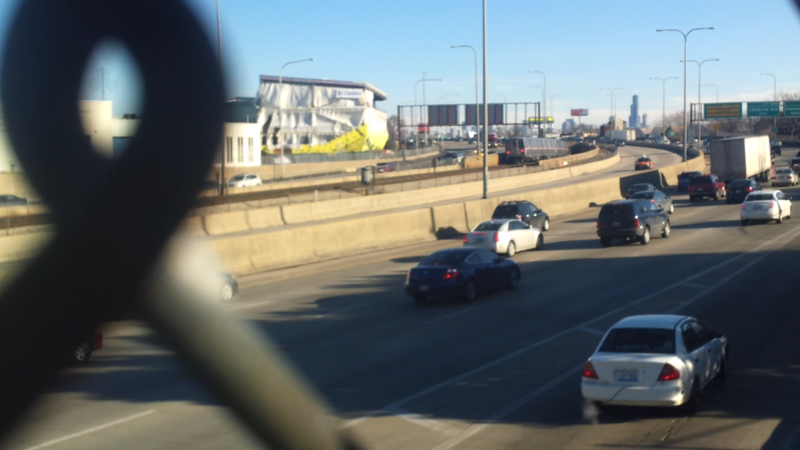 Yesterday as I was driving past Rosemont Yard, I looked in and saw a few 2400s (wrapped in red, white, and red stripes). I didn't get the car numbers but the destination signs said Howard. 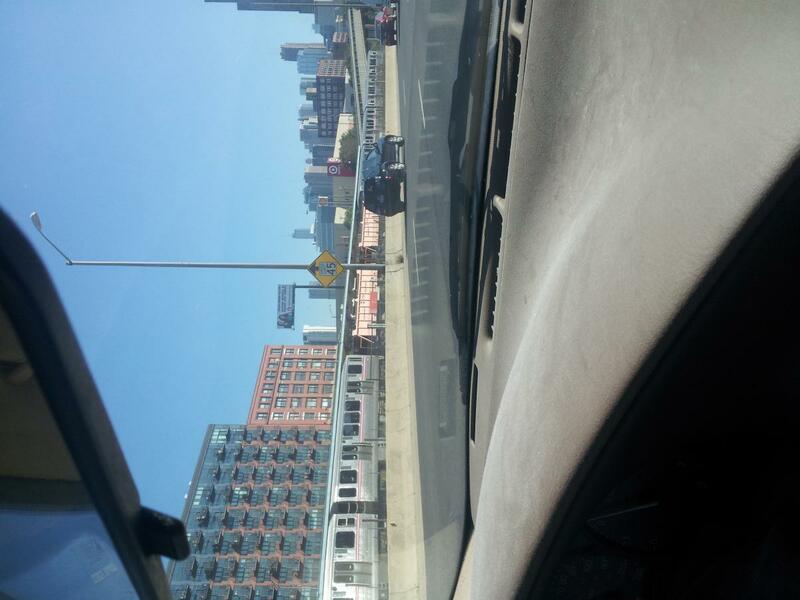 Could it be work cars for the Blue Line rehab? They are work cars, but have been work cars (at least part time) for maybe 20 years. * Contracts have not been awarded, and, in fact, there is no source for 80% of the needed money. Looks like they may be starting to work on the tracks at Kimball portal according to this picture. It was actually kind of cool riding the single track in the subway, they have these yellow strobe lights that flash about every 100 feet. 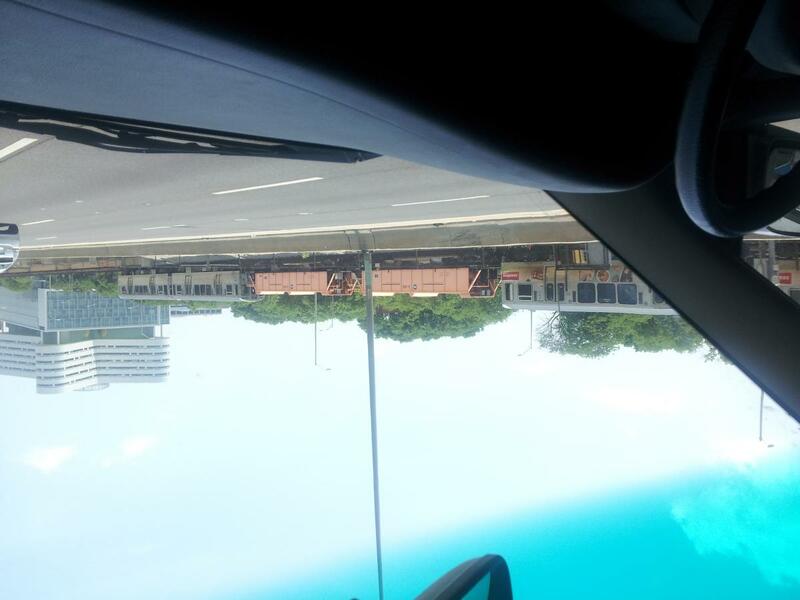 I wonder are those in place to warn of a train running against traffic? They also had the #2400's work train parked at Belmont. Cars were from Midway, I think #2415-20. It was nice seeing #2400's on the blue line again. Too bad I didn't get a picture. That's probably why the Forest Park bound trains were so close by each other around 11:30pm (Sat). They must had to put the 2400s over there this past Friday night/Saturday morning via Paulina Connector. Did they have the orange cars like in the photos? Also the strobe lights sounded like they looked pretty cool. *I don't know why the stupid pictures rotate funny. They were fine when I took them and when I looked at them on my laptop. You're correct. Great shots from the car you were in! If you look at the picture I linked too, (link's working, I fixed it) those yellow lights you see attached to the subway walls were the lights that were flashing. So those lights are always there, they are just turned on for special occasions. As far as the pictures you uploaded, those are #2600's and I believe they had the flatcar with them. I thought I read on the alerts this is going on today too. So maybe I have another chance for some pictures. That's strange, but what I usually do is open them in a paint program and if they look screwy use the rotate tool in the program and save them as jpg. And, as they say on the clips programs, hold the camera landscape. But why one was inverted is totally beyond me. On the main topic, while there was a Press Release that some contracts were awarded, the scope of the work that has started seems much greater than what was indicated a couple of weeks ago. I was wondering what those lights were doing there... I wonder if they were attached recently, or if they were there for a long time. Either way, I'm probably traveling too fast to see them normally. Huh, I thought in the picture rotated left they were 2400s. Thanks for the tip, but since I don't have a go to paint program (I'm on a Mac), I'm thinking next time I'll take a screenshot of the righted image, then post the screenshot. Interesting note. I'm hoping the next few weeks will also show what's going on. However, that would get you a very low res image. I go back to where there was actually MacPaint. I'm sure they have some other utility with that function, in the photo tools or an app. It was actually kind of cool riding the single track in the subway, they have these yellow strobe lights that flash about every 100 feet. I wonder are those in place to warn of a train running against traffic? 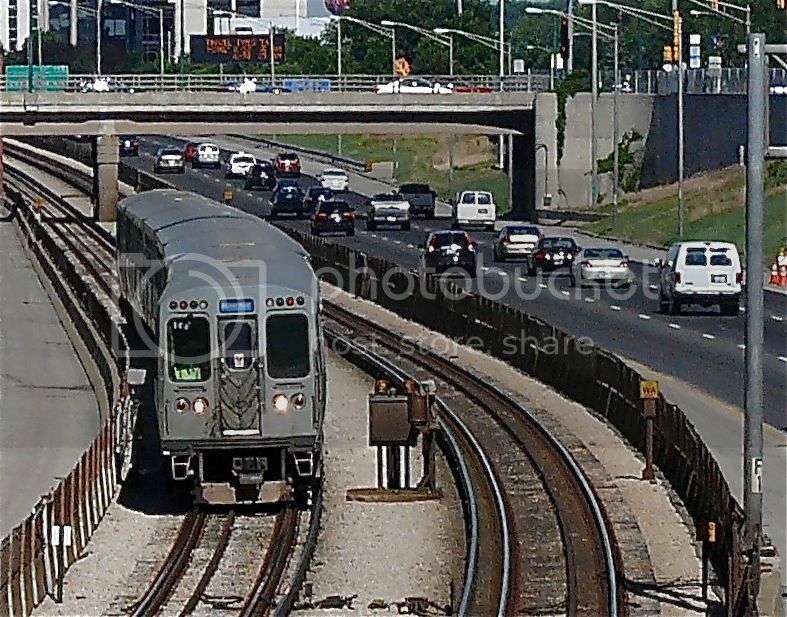 The original signal system that was put in when the WNW line was extended from Jeff Pk to Rosemont and on to O'Hare had bi-directional capacity and had the gum-ball lights that would flash when trains are run in the wrong direction. 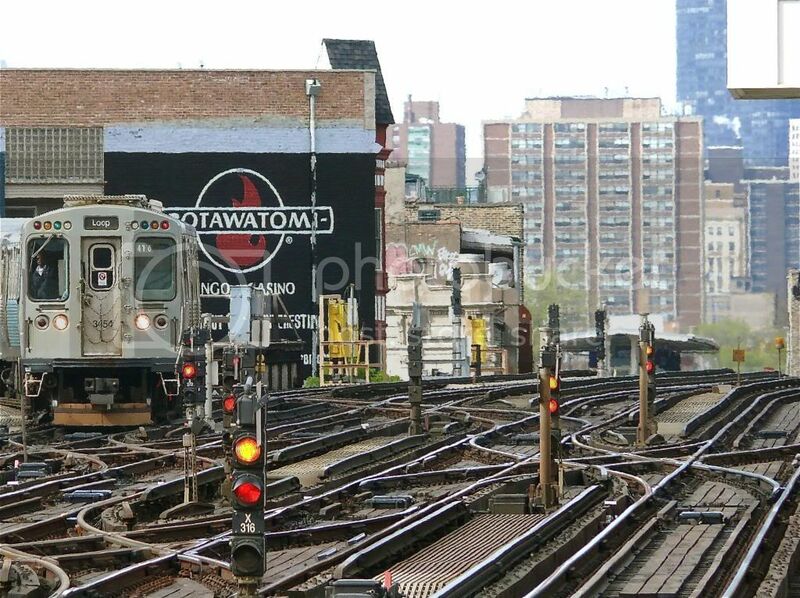 Over the years the CTA removed the signal capacity but kept the gum-ball lights. You could see them on the right-of-way. Do they flash with the newer signals system now in place? The other gum-ball lights installed are on the North-side, on track 4, between Addison and Belmont. 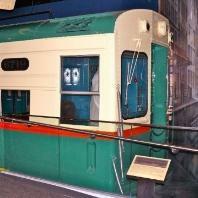 I remember a charter that ran SB on track 4 and did a lunch stop at Belmont. In those days, the Ravenswood only used track 1 on Sunday as a shuttle and didn't run to the Loop. I think those gum-balls are still there too. In Atlanta on their MATRA I saw white strobe lights that flash about every 1000 feet in their subways for regular trains on regular tracks as a warning for workers or anyone. Gum-balls between NB and SB tracks. Gum-ball between tracks 3 and 4 way on the right of the photo. Today they were doing the NB track surprisingly. So they are going to do tracks on both sides, first one and then the other in one weekend? That would really speed up the project. The work train was parked on the kimball incline today. Saw the TV news headlines and then this. But those getting pictures of the ballast trains and the like indicated that something was already going on, so we beat the press by about 23 hours. Yeah, tell me about it. Also, it's most likely that there will be substations for California and Damen stations. Not sure what you mean here. Electric substations (probably an independent project) or auxiliary entrances?